They were baked potatoes. They tasted like baked potatoes. I'm not really sure what else I should've been expecting. They were fine as baked potatoes. Really interesting, complex flavor. Like that the soup isn't completely pureed. I follow this recipe exactly and it works every time. You bring 1" of water to a boil, put a max of 6 eggs directly from the refrigerator into a steaming basket and into the boiling water, cover pan, and follow recipe boiling timing and cooling in an ice bath. I usually keep a small bowl of hard boiled eggs in the fridge for quick lunches or snacks or to add to salads. Perfect number of eggs if you are cooking for two. This is a great method for cooking asparagus. I didn't have time to peel the stalks (and I was afraid my spears were too thin anyway) but the roasting worked perfectly. I served the asparagus with aioli and they were gone in a flash. Made this without the beans and it was still very good. 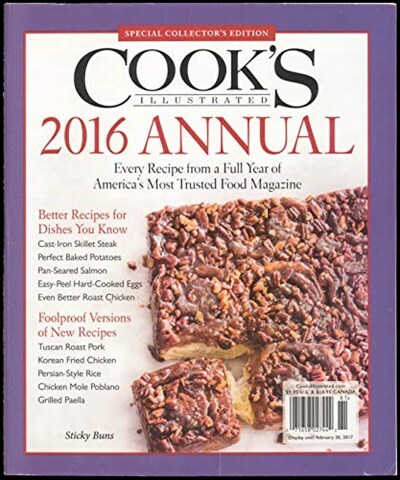 Cooks Illustrated 2016 Annual - Every recipe from a Full Year of America's Most Trusted Food Magazine - Better recipes for dishes you know - Cast iron skillet steak - Pan seared salmon - Easy peel hard cooked eggs - Even better roast chicken - Foolproof versions of new recipes - Tuscan roast pork - Korean fried Chicken - Persian style Rice - Chicken Mole Poblano - Grilled Paella - Sticky buns - Pear walnut upside down cake - The best frozen homemade yogurt - Classic chew oatmeal cookies - Red lentil soup - Vegetable straws - Braised roasted cauliflower - Pad Thai at home - Chicken mole poblano - Shredded Chicken Tacos - Perfecting Shrimp scampi - Pantry pasta sauces - Easier apple strudel - and many more!